It emits an ear piercing sound which is at once one of the most irritating noises imaginable and one of the most impressive physics demonstrations. The trained ear immediately recognizes the sound as a pure sign wave with a single frequency. Its highly irritating nature comes not just from it’s loudness but from the fact that we virtually never hear such a sound in the natural world. We heard it now only because we have made an aluminum rod resonate at one of its natural frequencies. Making a cylindrical metal bar resonate is fairly simple but takes practice. We use a cylindrical aluminum bar which is normally inserted into a bushing in a counter and used for supporting chemistry lab apparatus. The bar is slightly less than a meter long (98 centimeters) and two centimeters in diameter. While our aluminum rod seems to work very well, copper or steel rods or tube also work well. Shorter bar or tubes give a higher pitch. Longer ones a lower pitch. To make the bar resonate first rub a generous amount of rosin on its surface. The type used on violin bows which is available in any good music store works well. Next grasp the bar between the thumb and first finger of your left hand exactly at the rod’s center. This is easy to find since it is the "balance point" of the bar. Finally, grasp the bar near your left hand with the thumb and first finger of your right hand. Pull the thumb and first finger of your right hand along the bar’s surface while grasping it with a uniform pressure. At all times maintain your grip on the center of the bar with your left hand as the right hand slides toward the end of the rod. The bar vibrates with a standing wave which has a node at its center. The molecules near a node remain essentially stationary even though the rod is vibrating. This allows one to grip the rod at this position without disturbing the sound. The end of the rod is free to move and forms an anti-node which has a maximum amount of movement in the bar's molecules. Although the antinode’s movement is too small to detect visually, its presence can be demonstrated by touching the end of the rod. When this is done the sound immediately stops. A standing sound wave is caused by the reflection of sound waves traveling in the bar. When a wave hits the end of the bar it is reflected backwards. Since the end of the bar is free to move the reflected wave is in phase with the original wave and reinforces it's peaks forming an interference pattern with fixed positions for nodes and antinodes. You may have to rub the rod several times before it starts resonating. This begins as a faint sound. Continue adding energy to the rod by rubbing it until it reaches an ear piercing level. Do not attempt this in front of an audience or class until you have fully mastered the technique! In the beginning almost no one can do it, but this is part of the fun. Everyone wants to try and it is wicked entertainment to watch them as they fail. We once did this for an entire day at a street fair. The local television sports caster was about the only person to succeed. Not to be bested by a bunch of nerds, he worked with a determined look on his face for about 20 minutes until he produced the ear splitting noise. Despite our congratulations and slaps on the back, he didn’t, however, ask us to be on TV. Impressive as the demonstration is, it raises an equally large number of questions. First, why does the rod resonate at only one harmonic frequency? Most musical instruments use a similar principle but do not sound irritating since they produce a wealth of harmonic sounds. Second, if the rod can only be gripped in the center and if touching the end immediately stops the noise, how is it possible to rub the rod without damping the vibrations? Clearly the second harmonic is unlikely since it would have an anti-node in the middle of the rod. This would likely be damped out by grasping the rod. The next logical step is to analyze the sound output of the rod by making the rod resonate with a high loudness level. It's best to keep this burst of sound as short as possible or use ear plugs if done for lengthy periods. Lower loudness levels don’t always yield a pure sine wave. A short sound segment was recorded into a microphone connected to a Vernier MPLI system installed in a desktop computer with MPLI software. This particular system is no longer available but the same experiment can be done with a Texas Instruments TI-83 and CBL or with a Vernier LabPro connected to a computer. When the MPLI software is set for chart recording it gives a loudness verses time plot. When the MPLI software is set to fast Fournier transform (FFT) mode it gives an amplitude verses frequency plot. This is especially useful for detecting resonance frequencies. They appear as very high peaks on the FFT plot. The FFT plot gives a single frequency for our rod of 2574 Hz (see Figure 3). The frequency from the loudness verses time plot is the reciprocal of the time between two loudness peaks. Figure 2. shows that the time between peaks is about .004 seconds. 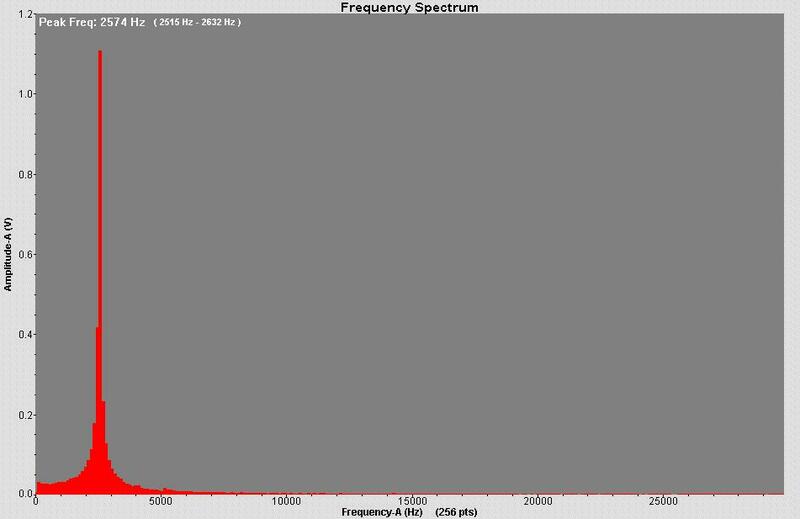 This gives a frequency of 2500 Hz. Generally the FFT and calculated frequencies are in close agreement. Using the 2574 Hz from the FFT plot gives a velocity of sound in aluminum of 5045. This compares well with the textbook value of 5000 m/s. Such close agreement confirms the hypothesis that we do indeed hear the first harmonic. Drums, pipe organs, guitars and just about all forms of acoustic musical instruments work by vibrating at natural frequencies but do not sound irritating because they contain many harmonics. By contrast we hear only one frequency with our rod. The likely explanation for the single frequency is that the bar is not being excited at any of its higher harmonics. To test this we attach the microphone to the end of the bar with a rubber band and rub the bar while recording the results in the FFT display. 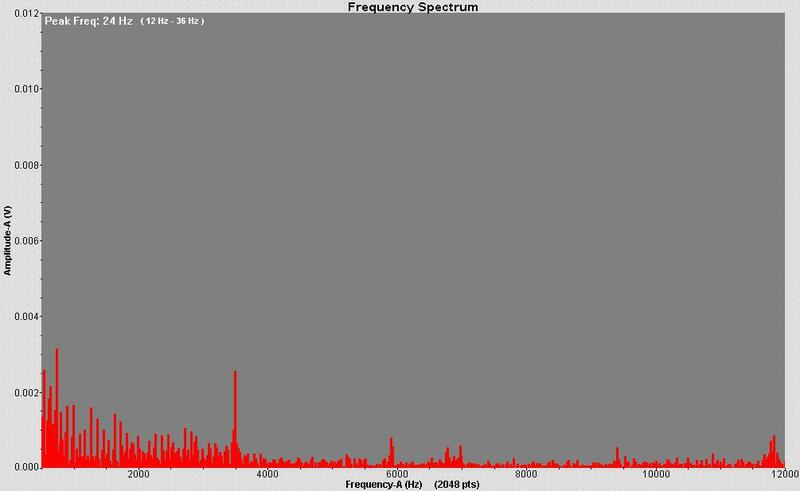 Typically this shows multiple frequencies similar to white noise (see Figure 4.). However, the highest exciting frequency is less than the third harmonic of the bar. Using poor technique does not make the bar resonate because it does not input enough energy in a frequency corresponding to any of the bar’s harmonics (see figure 5). This explains why most people cannot perform the trick without a significant amount of practice. The single biggest factor in making the bar resonate seems to be the amount of rosin on the bar. Rosin creates a high static friction between the bar's surface and a person's fingers. Static friction occurs when no sliding is present and prevents sliding from happening at least up to a point. When the shear stress between surfaces reaches a critical level they break lose and slide. The friction becomes dynamic which is much lower than the static friction and the high shear stress is temporarily relieved. The lower shear force allows the sliding to stop. This cycle is called stick slip and continuously occurs as the bar is rubbed. The stick slip action cases the vibration with results in resonace. The final mystery to be answered is why rubbing the bar does not damp out the vibrations. If the bar vibrated with a transverse wave which caused movement perpendicular to the bar’s axis, the gripping action of sliding fingers would damp the vibrations enough to prevent resonance. Since this does not happen, the vibrations must be longitudinal or in the same direction as the bar’s axis. In this case the gripping action would cause far less damping especially at low levels of vibration. We spent a long time pondering how to confirm this experimentally. We wanted to use cool stuff like laser beams, high speed photography through microscopes etc. but in the end, used a child’s xylophone striker. Holding the center of the bar, we carefully pinged the end in a longitudinal direction (the direction of the rod's axis) and analyzed the results with FFT. We repeated the experiment with a transverse ping on the rod's side (perpendicular to the axis) and again recorded the results. Theoretically, a longitudinal ping should create a longitudinal wave, etc. As seen in figure 6 the longitudinal wave’s dominate peak perfectly matches the resonating sound’s frequency while the transverse wave’s sound spectrum is considerably different. This supports the hypothesis that the resonating bar’s vibration is in a longitudinal direction. This analysis can be done even without FFT equipment. For most listeners the noise from the longitudinal ping sounds remarkably like the resonating bar’s sound although much quieter. The sound of striking the bar in the transverse direction is completely different. 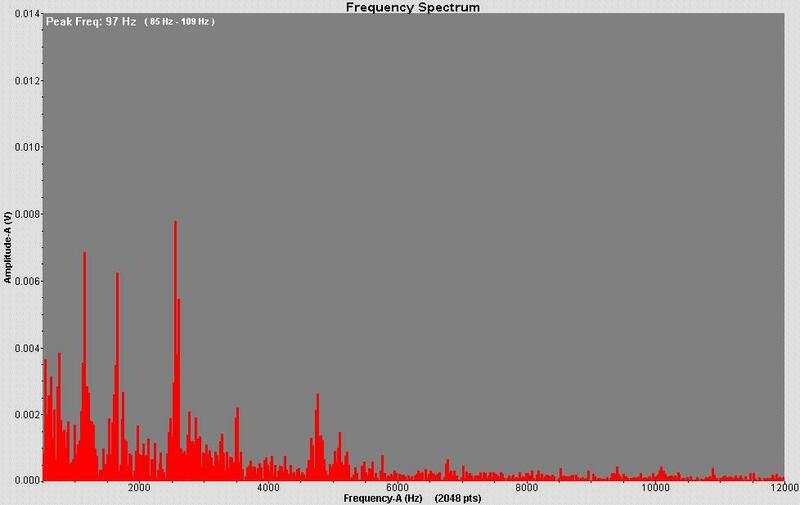 The sound spectrum from the longitudinal ping contains not just the first harmonic but also an additional smaller peak. Calculations show that it matches the third harmonic of the bar. The action of the striker hitting the end of the bar excites more of the high level harmonics than rubbing the bar's side. Indeed, striking an object and measuring the resulting vibrations is considered by engineers to be one of the ways to identify potential resonate frequencies. Good lab technique with the striker makes a distinct difference in the analysis of the rod. A light ping seems to work better than a heavy one. Also care needs to be taken to hit the rod either exactly perpendicular to its axis to cause the transverse wave or in exactly the same direction as its axis to cause the longitudinal wave. Errors in technique will result in simultaneously exciting the bar in both the transverse and longitudinal directions since the striker will have a momentum component in both directions. To further confirm the longitudinal nature of the bar’s vibrations, we tried gripping the end of the bar in the transverse direction as it was resonating. While this does damp the vibrations and reduce the sound level the effect is far less dramatic than touching the end of the bar. Although this series of experiments is not for beginners, it is dramatic and yields satisfying agreement between theory and measured results. The fact that broad spectrum sound input to the bar’s sides is emitted as intense single frequency noise from the bar’s ends is strikingly similar to the way a laser beam works. Whether done as formal experiments or as demonstrations the resonating bar always leads to stimulating physics discussions and a sense of wonder at the power of resonance.